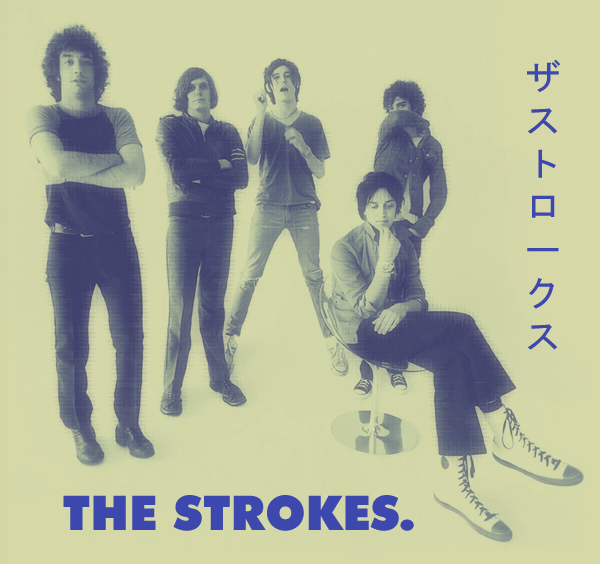 On Listening to The Strokes in Japan | This Japanese Life. Posted on September 22, 2010	by E.
In dreams, mind reading doesn’t have any side effects. You have access to people’s thoughts. You know secrets. You find out things that make you angry, excited, sad, embarrassed. But if mind-reading could be the subject of documentaries and not just comic books, I bet our protagonist would resent the endless chattering and long for solitude. You don’t notice how exhausting listening to a language is until you leave it behind. Sure, all of you back home can order food in a restaurant without nervously grinning and pointing wildly. Bravo, champs. Your brain is also working overtime filtering out noise. You endure the psychic bombardment of cell phone conversations, aggressive customers, guys screaming from cars about how gay you look. Functional illiteracy is a “mute” button. The chatter stops. There’s no meaning hidden in the roar, so you stop trying to find it. You become attuned to pure sensations: The sound of the train, cicadas, birds, the humming of fans. Other people become mysterious. Their actions become spontaneous. The smallest series of communications are major feats of willpower and patience. This might describe any expatriate in any country that supports the linguistically inept. But Japanese culture embraces silence. People don’t talk on the subway. Kids rebel by sleeping or staring out windows. People speak softly and keep to themselves in public spaces. The entire country is like a library in July. And yet, one afternoon of listening to The Strokes in Japan drowns out the entire island. The Strokes, The Velvet Underground, Joy Division, The Jesus and Mary Chain, etc – pick whatever you want, if it’s loud and “Western,” it applies. Tinny, treble-filled, amateurish guitars shatter the careful silence of a Japanese city. My first purchase in Japan was a stereo system. The first track out of shuffle was “You Only Live Once.”* Bike-chain percussion and stupid Julian Casablancas’ dorky lyrics gave me a kind of epiphany. The “Here I am!” of underground indie rock runs so contrary to everything Japanese that you can’t help but love the sheer audacity of “American Rock’n’Roll.” It wasn’t the song, it was its connection to my own American-ness. Since silence is distinctively Japanese – and noise, distinctively not – the process of filling a room with sound is instantly familiar and weirdly nationalistic. It’s assertive in a country that shuns assertions; it’s a bold claim in a land of socially lubricating ambiguity. It feels like home. This poses something of a paradox: I’m in a country I embrace for its silence, but I love to fill my head with this crappy American noise. It’s that paradox of negotiating an identity in a foreign culture. I have limited options. The humidity kills bagels and ironic T-shirts are redundant. What’s left is a sunny afternoon, an open window and my speakers turned too loud. It’s waiting for the cross walk light to turn green while a 9-year-old girl swings her lunchbox around as I’m listening to Cut Copy through ear phones. In America, I’d listen to music in a car. I drove a lot. The sound just floated in the air drowning out engine noise on long highway runs. I don’t listen to much music in Japan – I don’t usually have earbuds on the train; and I don’t listen to music while walking. Since I’ve started with mindfulness practice – the art of acknowledging that your thoughts and emotions are a story you’re telling yourself, rather than rejecting or suppressing them – I’ve noticed what happens when I do listen to music: It’s actually doing the same thing. When we’re present to emotions enough to identify them, music helps us fit it into the narrative arc of our lives. The classic example of this is the dorky habit of listening to certain songs while driving – or standing on a train – and imagining the music as a soundtrack in a movie where you are driving or standing on a train. For actions, this can be a kind of distancing technique; it can pull you out of the present, and modify the story of your surroundings into an epic delusion of grandeur and adventure. But I wonder, for emotions, if music doesn’t help us assimilate our internal stories as stories. If we’re feeling sad and listening to a sad song, it can help us look at the emotions and confront them – leading to a clearer head than if we’d ignored it or let it simmer. Sometimes we listen to music because we want to feel something. But sometimes we listen to music because we feel something, and we need something else to help us make sense of it. This entry was posted in Culture Shock, Homesickness, Thinking. Bookmark the permalink. Indeed! I have Polysics tickets, in fact. I’ll let you know how it goes. Julian Casablancas, says the know-it-all. They do have a guitarist named Nick Valensi in the band, though. Plus, if you ever find out that Ringo Shiina or her band (Tokyo Jihen) are playing near you, I would highly recommend you check ’em out. For my vicarious excitement, at the very least. You’ve got some f–king awesome writing going on here, bro. I found this post really interesting, because I think you’re right in one sense; when I was there, it did seem that people in Japan make a lot less noise than we do, at least in public places. But on the other hand, it always seemed to me that the lack of people-produced noise is very often replaced by gratuitous machine made noise, which can be downright obnoxious — like meat announcer guy in your supermarket (also see ビックカメラ, pachinko parlors, etc). But this kind of thing is about par for the course in Japan…a country where a zen rock gardens coexist with the Tokyo Tower as recognizable national symbols. The few months I lived in Tokyo and its surrounding prefectures were largely spent catering to Japanese students in sessions of full-day English-summer-camp-styled activities..
Music – particularly the harshest rock and most vulgar rap – was never as freeing as through those 円100 Daiso earbuds.